No, I haven't forgotten about the living room projects I have going - next to the kitchen, the living room is where I spend most of my time. We have to pass through it to get anywhere in the house and since I took all the pillows of the couch and the quilt off of the wall, I think about my plans for them every day. I've just been in the collecting stage of this project - collecting fabrics. I have something with a very patchwork feel in mind. Some of these are from my stash, but I have also collected a fair number of new, but small, pieces for this little project. Most are 1/8 and 1/4 yard cuts - perfect for patchwork! I hope to get a chunk of time this weekend to get a good start on the actual sewing of these pillows - hopefully I will have more to show next week. And here's an interesting page from my latest Better Homes and Gardens magazine - all of my colors on one page. This came a week or two after I had decided on the colors. I'm just using a little lighter hue of the blue and not really using any brown, although all of the furniture in our living room is brown, so I suppose that will count for the brown. I can't wait for this to all come together. I've been wanting to do new pillows for about a year now, but for the longest time could decide what I wanted to do. I'm glad I waited because I'm really excited for these colors and how this all going to come together. The pictures are hung in my thrifted and painted frames. All but the one around the family picture are from the thrift store - that one is from TJ Maxx, on clearance for $3, and actually gets to have the credit for inspiring this whole living room transformation. I've been wanting to make some changes in the living room for a while now, but wasn't quite sure what. When I saw this picture frame, it all came together for me! Sorry about the low light - it's snowing today and we have a really dark living room. I hope our next place has more light coming into the living room! And when I got home, I realized I was going to finally be able to use this painting I thrifted last summer (for $2) that I love! When I first put it in the living room, it didn't quite seem to go with all of the golden hues that were in there previously, but it fits perfectly now. I think I'm trying to embrace autumn through apples - apples in my crafting, apples for the kids every day at lunch, and drooling over Katie's apples. And it is definitely time to embrace the autumn! It's nice and chilly today with some great sunshine and it's supposed to snow this weekend - wait, that's winter. Ok, well I'm hoping the snow is a brief visitor and fall returns soon. Yesterday, I finally covered some tin cans that I've been saving for a while with plans to use them as a pencil and gadget holders. I got out the paper and decided they needed a little something else - how about an apple? So I whipped out the Wonder Under (or you could use Heat and Bond) and scraps, traced out my apples, got out the iron, and put them right on the paper. And then I just stitched right around the edge - I love the sound of sewing on paper! And remember the apples in this post? They've found a home on the outside of some tote bags. I've cut out six of these (why do I always think that working in large multiples is such a great idea? ), and have two finished. The others will come, these are pretty quick to whip up, which was the point when I put these together. I wanted something that would be faster for me to sew so I can have more variation in the price range in my shop, which is where they will be soon. I think I need to make my favorite apple cake (interesting - that post is from a year and a day ago - it must be the time of year for apple cake) this weekend - yes, lots of baking this weekend to warm up the house! We had a great weekend with my Mom here - on Saturday, we had a marathon jam and beet canning fest. I didn't get a shot of the jam since you saw some of that a little bit ago, but I did get a shot of those beets - I just love their vibrant color! It was also general conference weekend - the kids didn't let us watch much, but we've gotten into the habit of downloading it and watching it later. 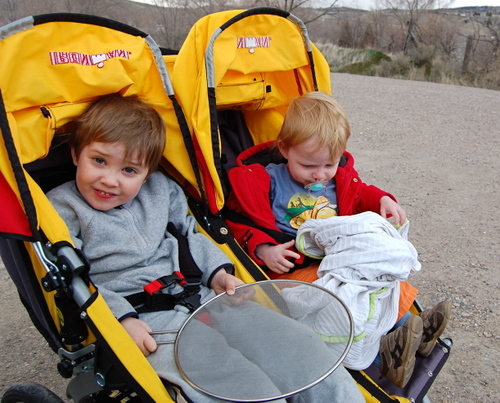 Someday my kids will be able to let us enjoy conference again, right? Maybe they will even enjoy it with us - a girl can dream can't she? Part of general conference is a women's meeting that occurred the previous weekend and when I heard this talk by our beloved President Ucthdorf, I knew I wanted to share it with you. I had meant to do it early last week, but the text for the talk wasn't available until later this week. It reminded me so much of my creative and generous blogging friends. Thank you so much for inspiring me! On one of our summer jaunts to see family, my mom, grandma and I went to a quilt show. They were all so amazing and inspiring. Someday I want to make a quilt to put in a show. I think this is my favorite -it's a mini quilt and those hexagons were miniscule. The detail is so amazing in this quilt, the colors are just perfect, and I love the theme. It's no surprise that this one won a prize. This quilt top was actually an antique that the quilter had found, added the border and then hand quilted - definitely my kind of project. I could only be so lucky to find such an amazing quilt top! This is another one I loved for it's vintage goodness- each Dresden Plate is made with scraps from the quilter's grandma. Another shot to show just how yummy those Dresden Plate fabrics are! 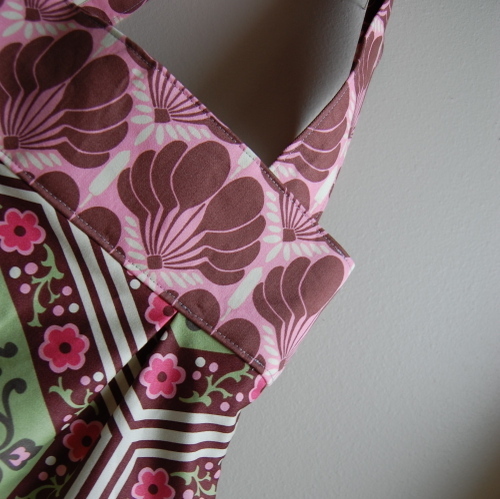 And this one is just fun - I love all these little aprons! And the aprons bring me to something else I wanted to mention. Design Mom has declared this Thursday, August 28th NieNie Day. If you haven't heard about the tragic airplane accident that Stephanie Nielson and her husband Christian were involved in, you can go here to read about it here or here. I have been reading Stephanie's beautiful blog, the NieNie Dialogues for quite some time now and have been truly inspired by her lovely life. Her accident shocked me. She and her husband are in for months of recovery and the cost will be enormous. In order to help, Design Mom will be holding a silent auction on Thursday and donating all proceeds to the Nie Recovery Fund. 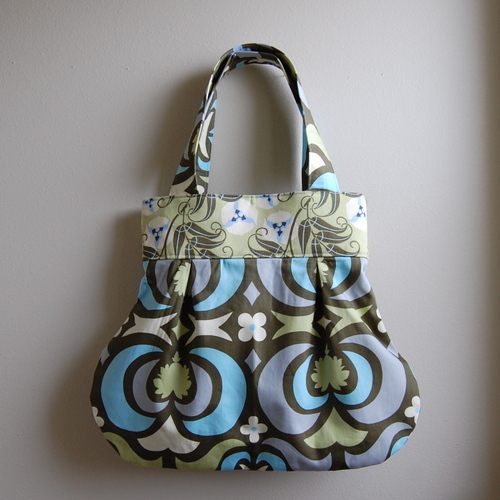 She will also provide a link to anyone else who wants to host a silent auction on their blog. And if you feel like you don't have the readership to host your own auction, Leslie at A Room Somewhere will host your item for you - just go to her blog for details and e-mail her. I'll be hosting a silent auction here, probably an apron, in honor of Stephanie's love of aprons. We crossed a lot of things off of our to-do list today. 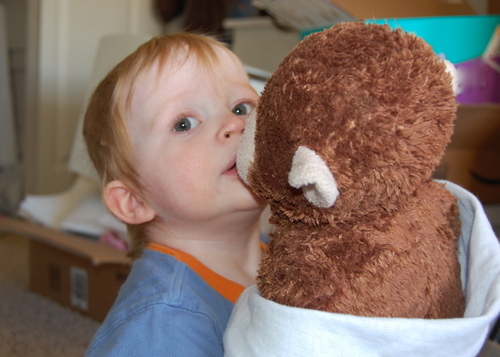 1. kiss George, our little monkey who was playing "baby" at the time. 2. a trip to the library. we were actually returning these, but I still have the elephant from the Softies book on my to-do list. 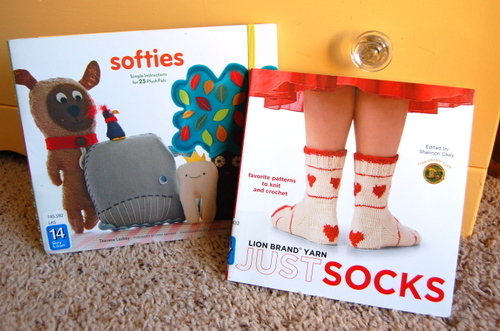 And the sock book is just one more reason that I really need to learn to knit. 3. another trip into the jungle - this time with another kitchen gadget. It's really a guitar, didn't you know? And we'll be back tomorrow to share one of our favorite (and super easy) things to make for Randi's recipe exchange. I'm making good progress on my sixteen bags. These three are already in the shop and I finished two others last night. I'm hoping to get a good start on two more tonight. This is going as well as could be expected - just the right amount of work to keep me busy without overwhelming me. That's just how I like it. Wondertime Printables: A picnic, a farm, a garden, and a kitty all ready to download, print, cut, and play! 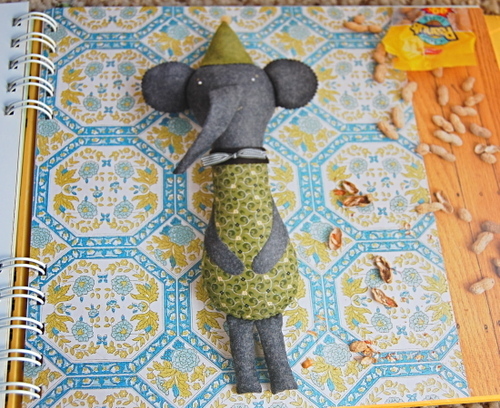 The Crafty Crow: You may have seen this one already - a new Kid's Craft blog by Cassie of Bella Dia. Lots of ideas for crafts with kids. I think we may have to stage a scavenger hunt soon and make our own chia pet! I'm excited to use these ideas this summer. 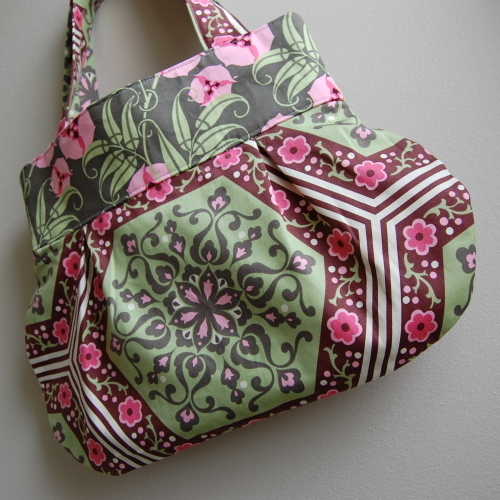 Sparkle Power Sew Along: A new sew along group started by Candace of Sparkle Power. March is potholders and table runners (I have a good idea for my potholders - I hope I find some time to do them) and April-May will be clothing and accessories. 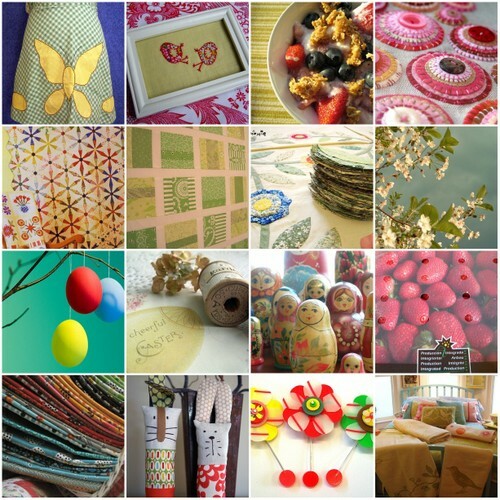 CraftPad: My favorite new blog - this is where I found the Wondertime Printables. Take a look at this mail set and play house - my kids would love a play house like that! I spent a good part of my afternoon choosing photos and trying to figure out this mosaic maker. The above is what I have come up with so far - I still have a little more figuring out to do - like how do I get the links to all the pics at the bottom (if you want to know where they came from, they are all in favorites on Flickr), and how do I arrange to photos instead of having them arranged for me? Something for another day. For now I am happy to just look and be inspired. Here's to Spring arriving...soon, please! !